May 29, 2010 marked the 230th Anniversary of Buford’s Massacre Battle of the Waxhaws located at Buford’s Crossroads, South Carolina sponsored by the South Carolina Sons of the American Revolution. 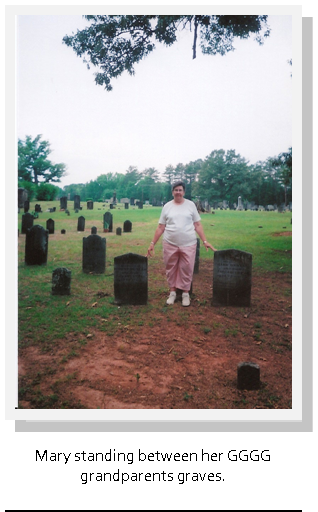 This is the area that my GGGG Grandfather, my Revolutionary War ancestor, lived and is buried in the Old Waxhaw Presbyterian Church Cemetery. The Waxhaw region is located between South and North Carolina in Lancaster, South Carolina originally Camden County, South Carolina. Many of the settlers came from Lancaster, Pennsylvania in the 1150’s and were of the Scots-Irish lineage while others came from Virginia and North Carolina. The Waxhaw settlement was named for the Waxhaw Indian Tribe located in the area. The Battle of the Waxhaws is the name of the battle that took place between a Continental force led by Colonel Abraham Buford and a Loyalist force led by Banastre Tarleton. 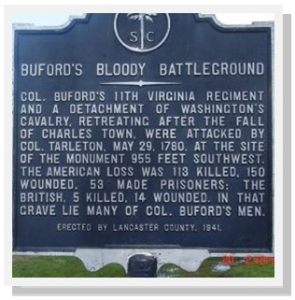 Col. Buford led a force of 300¬-400 men comprised of a Virginia Regiment and a company of artillery to assist Patriot forces in the siege of Charleston. Before arriving, they learned that the city had already been captured by the British, and they turned back to Virginia. Lord Cornwallis sent Lt Col. Tarleton in pursuit of Col. Buford in an effort to capture the South Carolina Governor who was traveling with Col. Buford. When Lt. Col. Tarleton caught up with Col. Buford the Governor had already separated from Buford’s detachment. While waiting for his reserves to catch up, Lt. Col Tarleton sent a column forward to ask for Col. Buford’s surrender to which Col. Buford decided to continue marching rather than prepare for battle. Tatleton’s entire force set upon Buford’s column and tore Buford’s column to pieces while many of the Americans began laying down their arms and offering to surrender. This is where the debate begins. 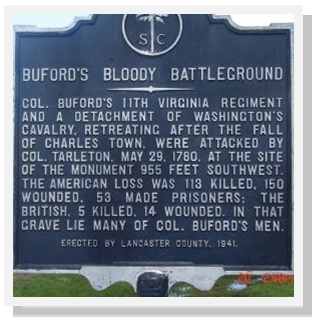 A Patriot eyewitness, a field surgeon, states CoL Buford raised a white flag “expecting the usual treatment sanctioned by civilized warfare.” While Buford was calling for quarter, Tarleton’s horse was struck by a musket ball and fell. This gave the Loyalist cavalrymen the impression that the Americans had shot their commander while asking for mercy. The Loyalist became enraged and attacked, carrying out “indiscriminate carnage never surpassed by the most ruthless atrocities of the most barbarous savages.” Tarleton’s men stabbed the wounded where they lay, regardless of implied surrender. The American casualties were 113 killed, 147 wounded and held prisoner. The British losses were 5 killed and 12 wounded. After the massacre, the wounded were treated at nearby churches. The battle temporarily consolidated British control over South Carolina and Patriot sentiment was at low ebb. Many who might have stayed neutral flocked to the Patriots and “Tarleton’s Quarter!” and “Remember Buford” became rallying cries and became responsible for forming volunteer forces who participated in actions against the British Loyalists at Musgrove Mill on August 18,1780 and the decisive defeat on October 7, 1780 at King’s Mountain. In memory of Robert Dunlap who died July 14, 1831, aged 80 years. He took the oath of allegiance in the year 1776. Served in the Revolutionary War and was a genuine patriot, faithful friend and an honest man. True to cause to see his country righted. True to the spouse to whom his faith was plighted. True to his offspring whom God had given him. We would be true to him and true to Heaven. The Dunlap family immigrated to Lancaster, Pennsylvania from Scotland in the early 1700’s. Robert was a county judge in Lancaster, S.C. I am a descendant of his fourth son, John who moved to Heard County, Georgia in the mid 1830’s.